Protector of the Mane is an epic Monk creature card. Protector of the Mane was the monthly card for May 2017. It can be soul-summoned by anybody regardless of participation in ranked. As with all other monthly cards, the premium version was not awarded to anybody and must be obtained through soul-summoning. "This one is far too sleek for his opponents." This card's ability applies the Warrior Guard card effect. 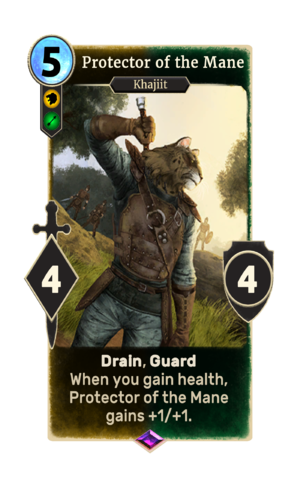 The card is named for the Mane, the spiritual leader of the Khajiit.